When you are accustomed to the finer things in life – designer shoes, champagne, VIP lounges, exotic holidays abroad, a luxury penthouse, expensive wheels – what independent young woman in her right mind would want to let them go? 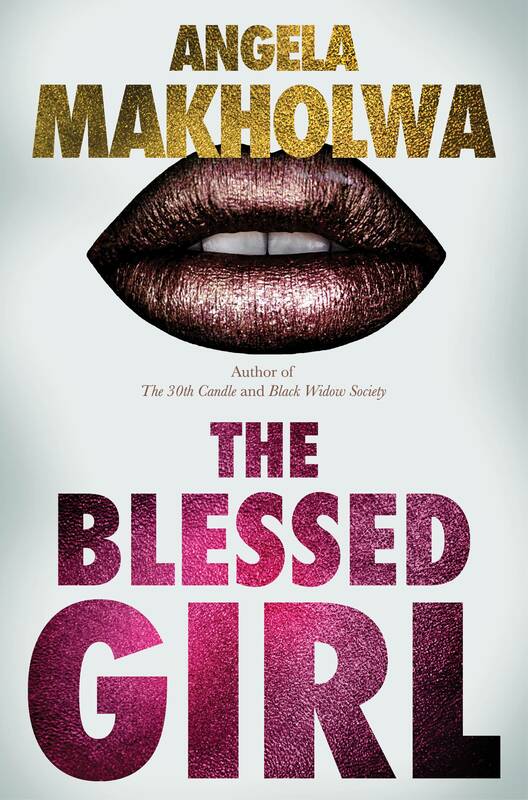 Certainly not the beautiful, ambitious and super-streetsmart Bontle Tau, the girl who has used her good looks and winning charm all her life to get exactly what she wants. The lifestyle doesn’t come cheap, though, nor does maintaining the body that allows it (just ask Dr Heinz at the beauty clinic). Luckily, Bontle has a degree in MENcology, and there is no shortage of blessers at her penthouse door, eager to give her all the love and (financial) support she needs. 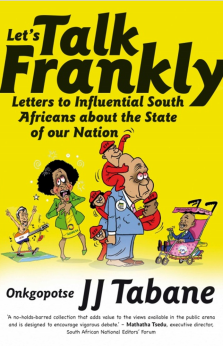 Papa Jeff might be overweight and getting on a bit, and receiving some unwanted attention from the Hawks; and Teddy might not have fully come through for her on that messed-up tender business; but Mr Emmanuel, the Nigerian businessman with deep pockets and the possibility of conferring second wife status … could that be love? Keeping all her boyfriends happy and living a fabulous life is not without its challenges. 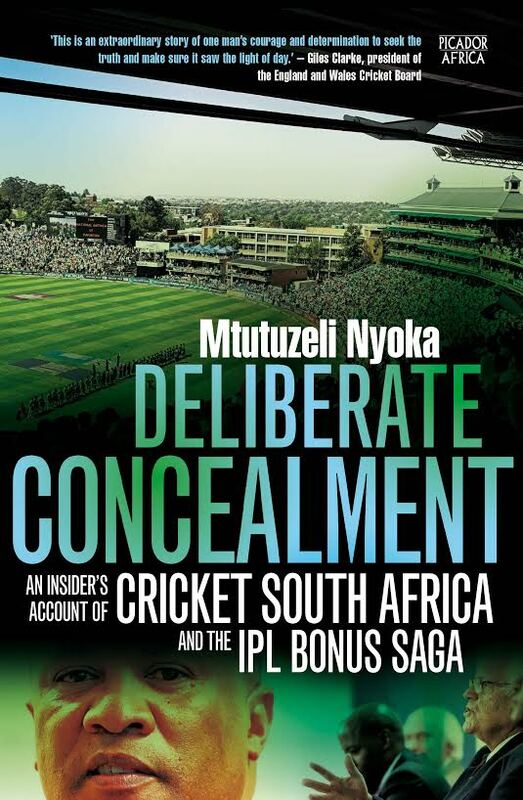 With so many people clamouring for Bontle’s attention – from her shebeen queen mother Gladys in Mamelodi, who is taking strain bringing up her teenaged brother, Golokile, on her own; to her girlfriends, Iris and Tsholo; not to mention her soon-to-be ex-husband, the ever-patient, ever-loving Ntokozo, Bontle barely has time to post on Instagram these days. 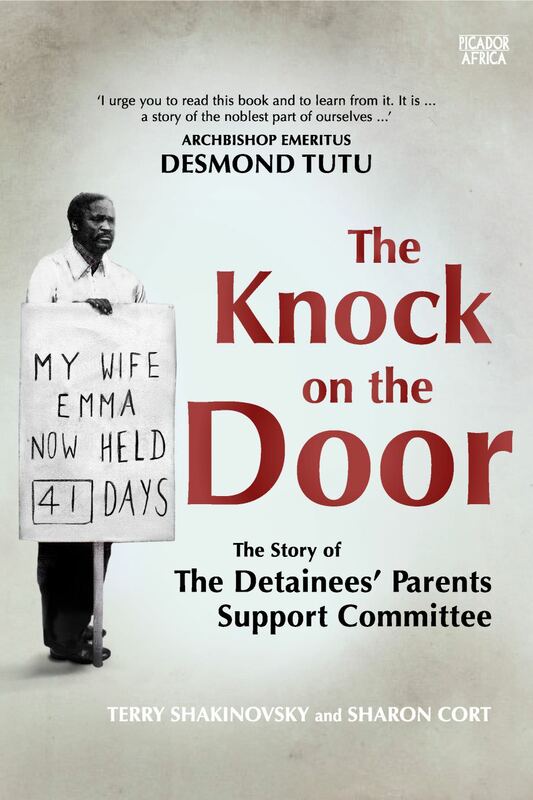 The Book Revue will be in conversation with Audrey Coleman, one of the many parents whose children were detained in the book The Knock on the Door: The Story of the Detainees’ Parents Support Committee on Thursday, 15 March. The Colemans were an ordinary family until one of their sons was detained and held for 5 months. 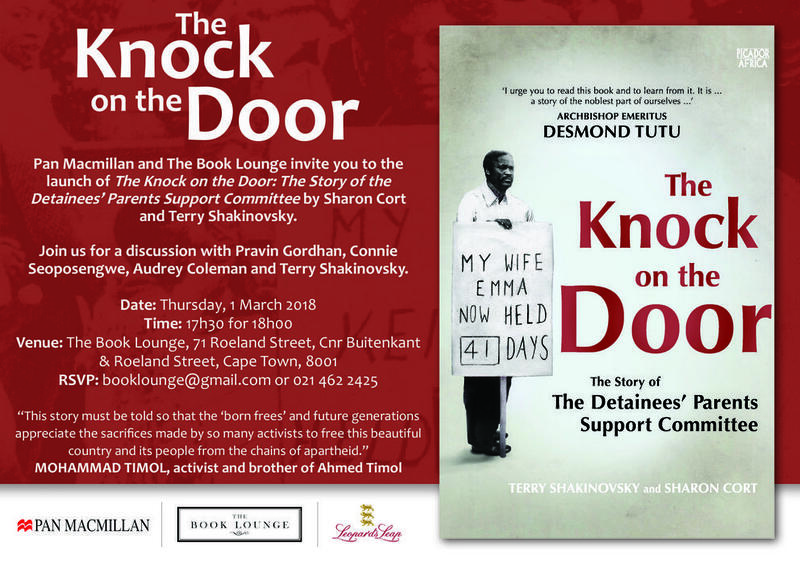 Max Coleman went to John Vorster Square almost every day until his son’s release and he and Audrey went on to found the Detainees’ Parent Support Committee. 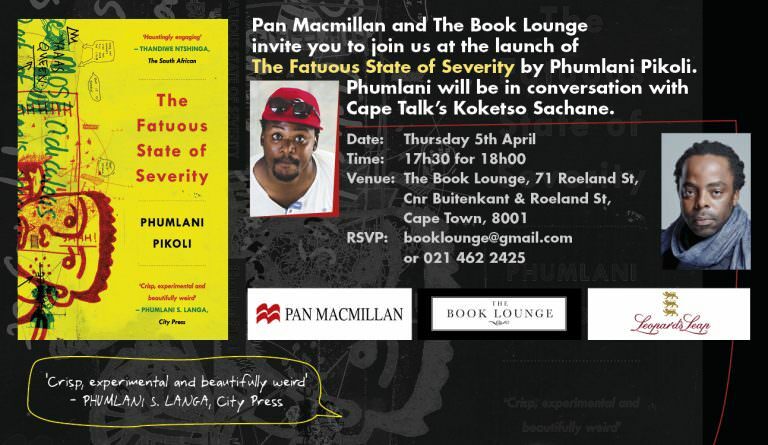 This book is a sobering reminder of the horrors of the apartheid era and how the State misused its powers to harass, torture and repress South Africans. It is also a wonderful testimony to the strength of the human spirit and to the power of the ordinary people to stand up in extraordinary times. Just because you can see it, doesn’t mean it’s true. ‘A cracking novel. Brilliant original writing, free of clichés. 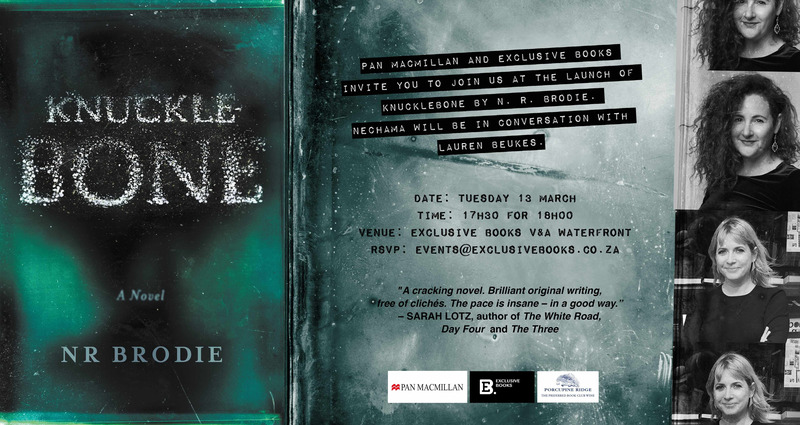 The pace is insane – in a good way.’ – Sarah Lotz, author of The White Road, Day Four and The Three . NR BRODIE is a veteran journalist and best-selling author of five books.